ANY 4 BIG 60ML BOTTLES FOR £40!!! Shop BIG BOTTLE BUNDLE DEALS ANY 4 BIG 60ML BOTTLES FOR £40!!! 240ML OF JUICE FOR £40 – SAVE £20!!! OMG! ANY 4 BIG 60ML BOTTLES FROM OUR ENTIRE RANGE!!! 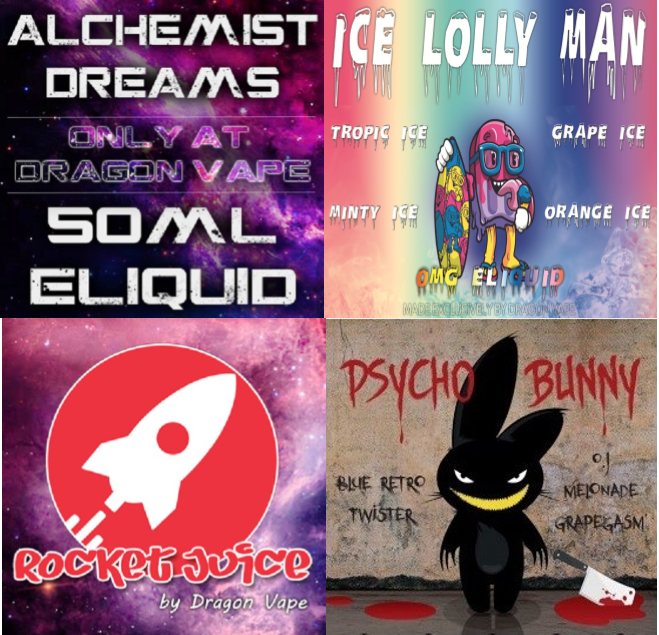 ALCHEMIST DREAMS, ICE LOLLY MAN, CHUBBY JUICE, DOUBLE DRIP, LEMONADE NATION, ROCKET JUICE, PSYCHO BUNNY + MANY MORE!!! NEW RANGES ADDED FOR XMAS & 2019!!! Dragon Dreams:- This deliciously fruity blend is our take on Red Astaire! Werewolf Dreams:- So Fruity and Cool it’s a knock out on Heisenberg! ★NEW★ Vampire Dreams:– Like Werewolf Dreams (Heisenberg)? Then this “vamped” up dark version is for you. A delicious dark blast of blackcurrant added to the already famous formula. ★NEW★ Jaguar Dreams:- This is Dark & Strong- Can you handle it? Deep black grape flavour and blackcurrant notes with an intense cooling menthol. Chubby Juice – Opal Burst – Everyone remembers Starburst (aka OPAL Fruits)? Super fruity just like the childhood sweets! 1 review for ANY 4 BIG 60ML BOTTLES FOR £40!!! Best deal! The Psycho Bunny stuff is £12 each everywhere else. Took a punt and tried some of their own brand juices and i don’t regret it! Dragon dreams and blackcurrant ice are amazing! so unique!